The final cut Pro timeline with all the raw interviews with sound synced. Assembling a cohesive piece from a series of interviews can seem like a daunting task. When the footage first comes in it can land like a plate of spaghetti with all these different strands you can follow and directions the story can go so it's important to tackle it step by step. With our Raiders documentary we started by watching all of the raw interview footage and making note of the different topics covered. Having also shot the interviews helped immensely because we were already familiar with how the discussions went and what was said. From there we created a new timeline with title cards marking the different chapters of the documentary. These are temporary markers that we'll use to build the segments and from there we'll find the best way that they fit together as a whole. They're the purple blocks in the timeline below. This is the chapter all about the legacy of the raiders which then leads into our wrap up. At this stage there isn't any fine cutting but just all the interview moments we know we want to use here. We fine cut the interviews, removing "ums" and "ahs" and cutting sentences together to form a single idea that the speaker is presenting. We are never making people say things they never intended to say but rather finding a clearer and quicker way to say them. It's important to see the interviewees on screen but we also don't want this to become a series of talking heads. Hockey is a fast paced sport and we knew our editing style had to mimic that pace when it came to cutting - keeping the audience engaged by showing rather than telling. We spent many weeks shooting and we had a lot of game and practice footage that we could form into some compelling action and story moments. It's here that we'll also start sourcing music, which is important for this documentary so that we can really find the pace of the edit. You can see in the photo above that the bottom layer of the timeline shows the interviews that we used to build the foundation of the story. We then essentially paved over them with our b-roll footage and placed gaps between the interviews to space them out and to fit the tempo of the music. In the two images below you'll see the Final Cut timeline of one particular sequence in the film. The left side is the sequence at an early stage when it's just a series of interviews stuck together and before any fine cutting has been done. On the right is the sequence in its very last stage. As you can see music has been place, it's the audio track marked green, and it has been fine cut with b-roll. There's also a final third layer on top which is the colour corrected footage that's been exported from DaVinci Resolve which I want to talk more about after we discuss the audio a bit. IZotope's RX 6 Advanced performed magic on a lot of our rink side interview recordings. We used the powerful iZotope RX 6 Advanced software to clean up some of the audio issues we had. Many of our interviews were shot rink side, sometimes while games were going on and as you could imagine this led to some pretty bad background noise. With RX, we were able to open up the audio waveform, isolate the speaker's voice and pull out a lot of the background noise. These audio files were rendered out and brought back into Final Cut Pro where we did our final mix with interview audio, b-roll scratch audio that was recorded on the camera mics and music. Given the "run and gun" style in which most of this was shot we think the resulting final mix is pretty solid. For colour grading, an XML file of the edit was made and sent to DaVinci Resolve. The raw, uncorrected footage was also rendered into an Apple ProRes Quicktime file so that any stabilization effects were properly translated over to Resolve. 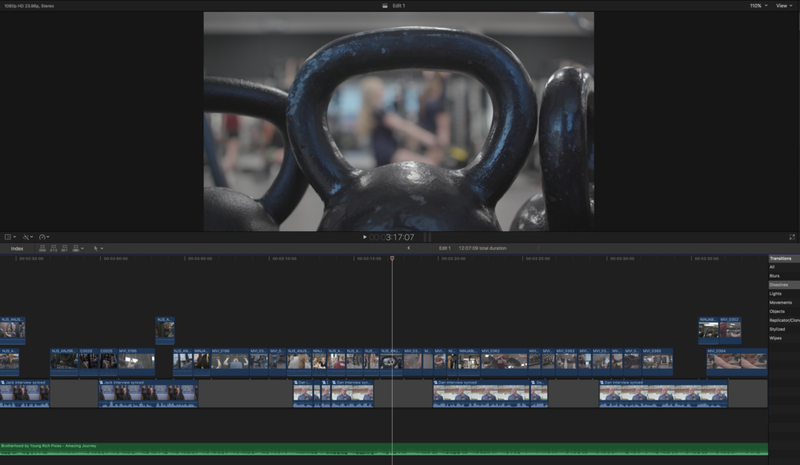 The ProRes Quicktime was layered over top of the Resolve timeline and cut to match the edits. Shot in High Definition on the Canon C200, Canon C100 and the Sony A7Sii, the images required a lot of colour and contrast corrections to properly match. The goal was to make it seem as though only one camera was used. The video below is a split screen demonstration comparing the raw footage with the final colour grading. The final documentary is the result of 6 months of work and we couldn't be happier with how it all turned out. A big thank you goes to the entire Raiders team from the players to the coaches and the entire hockey community in St. Albert. They were so supportive the entire way and gave so much creative freedom to us. Good luck to all the teams on the season ahead! Newer PostMaking "Genesis of Luxury"
Older PostiZotope RX 6: Dialogue Repair on the short film " Mommy and Me"